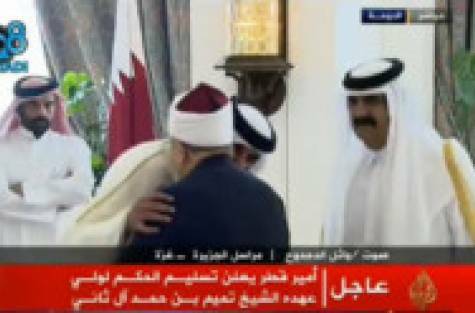 June 26, 2013 The old man was assisted by an aide as he walked up to the former and new emirs of Qatar to offer his congratulations on the peaceful transition at the top of the state and the hand-over of power. The Emiri Court in Doha was filled with well-wishers, but Shaikh Yousuf Al Qaradawi was taken directly to Shaikh Hamad Bin Khalifa Al Thani and Shaikh Tamim Bin Hamad Al Thani, the outgoing emir and the new emir. The father promptly moved forward and kissed the frail-looking man in a gesture that indicated the deep trust the two men have developed over the years. The scholar then moved to the son, 33, the youngest ruler of an Arab country. Shaikh Tamim planted a kiss on Al Qaradawi’s head and then his shoulder. The images beamed live on state television immediately sparked a lively debate on social media and microblogs and questions abounded on the meaning of the gesture. Al Qaradawi is not a regular religious scholar or a simple Friday mosque preacher. Over the years, the Egyptian-born cleric has acquired a special status on religious, social, economic and political ideas and talks. Doha-based Al Jazeera channel, the most viewed station in the Arab world, helped take him into the homes of millions of viewers, particularly through a weekly one-hour-long talk show in which he shared views and offered advice. As a prominent supporter of the Muslim Brotherhood, he helped propagate their ideology and views on everything and, mainly in the last two years, on political matters.